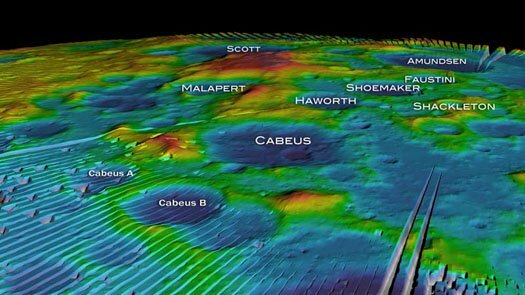 Vast pockets of water ice numbering in the millions of tons have been discovered at the north pole of the moon, opening up another region of the lunar surface for potential exploration by astronauts and unmanned probes, NASA announced Monday. More than 40 craters ranging from 1 mile (2 km) to 9 miles (15 km) wide were found harboring the water ice, which was detected using NASA?s Mini-SAR radar instrument on India?s Chandrayaan-1 lunar orbiter. The instrument is also known as Mini-RF in NASA parlance. The ice was discovered in permanently shadowed craters at the moon?s north pole. Similar conditions of perpetual night exist at the moon?s south pole as well, where water ice was also confirmed to be present last year. Because these regions never see sunlight, water can stay in its frozen form indefinitely. Last September, NASA and other scientists confirmed without a doubt the existence of water ice at the moon?s south pole, as well as signals of water molecules across large areas of the lunar surface. Several spacecraft, including India?s Chandrayaan-1 probe that carried the radar instrument used for the new findings, found hard evidence of water on the moon. In October, NASA crashed two impactor probes into the lunar south pole in an attempt to kick up clouds of water ice and measure it from an orbiting spacecraft and other space and ground-based observatories. The subsequent analysis turned up significant amounts of waterand water vapor in the debris cloud, NASA scientists said. Chandrayaan-1?s Mini-SAR radar was one of two instruments involving NASA on India?s Chandrayan-1 spacecraft. The probe also carried the Moon Mineralogy Mapper for NASA. A version of Mini-SAR, called Mini-RF, is riding on NASA?s Lunar Reconnaissance Orbiter. India launched Chandrayaan-1 probe in October 2008 and carried 11 instruments to observe the moon from lunar orbit. It was India?s first moon probe and carried an impactor probe that it unleashed in November 2008. The spacecraft went offline in late August 2009 after an abrupt malfunction cut off communications with Earth. India is planning a successor to Chandrayaan-1, dubbed Chandrayaan-2. The name Chandrayaan means ?moon craft? in Sanskrit. The new Chandrayaan-2 mission is slated to launch in 2013, according to Indian news reports.